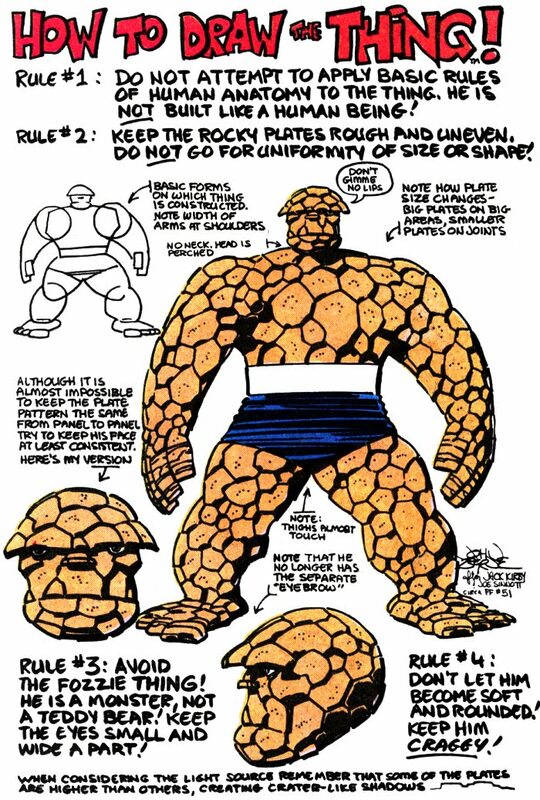 Kleefeld on Comics: How To Draw The Thing! It's really hot shot Byrne the Living Ego, lecturing every other artist who worked for or might have worked for Marvel in the 1980s that "this way (my way) is the only right way and you must do it this (my) way or else you are wrong wrong wrong!" 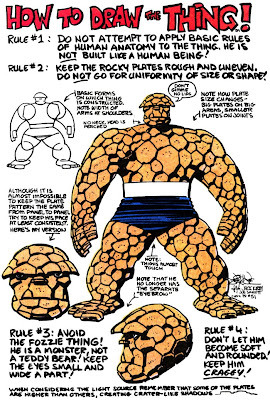 I mean, I actually prefer the Byrne version of The Thing to most other interpretations, but yeeesh. To be fair, though, he also was effectively put in place as the sole arbiter of the FF, not only handling the writing, drawing and inking chores on the main book himself but outlasting several of the books' editors. I'm not saying this page doesn't smack of hubris, but Marvel had put him in a position where it would be hard NOT to have a strong sense of ownership over the characters. I think Marvel collectively had realized what they had done eventually, and worked to counter that in the late 1980s trying to rein in creators having so much control over Marvel-owned properties. It was those two different approaches coming to head-on clash that led to the She-Hulk leg-shaving incident in 1989, and effectively brought direction of the IPs solidly back in Marvel's court. No wonder Liefeld found Badrock so easy to draw. Those drawing rules apply to ALL of his characters. Sadly, none of Liefeld's humans have more appeal than a slab of concrete.